During the Great War young men who had a connection or a common interest, joined the fight. As seen in the previous post the men from the Caledonian Hotel joined up As did men who were from an area – the Leeds Pals and the Barnsley Pals and the Accrington Pals for example. Other groups and associations also formed battalions – men who were barristers, public schools and sportsmen to name a few. One such group is the subject of a podcast – Rugby players. The rugby players were among the first men to volunteer and leading from the front, they paid a high prices. The National Archives, podcast tells the story behind award winning author, Stephen Cooper’s new book After the Final Whistle: The First Rugby World Cup and The First World War. The podcast is a very informative listen and if you are a rugby fan, you might hint that this book would make a nice ‘stocking filla’! 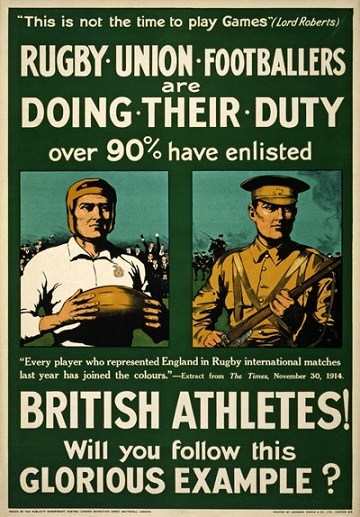 Wikipedia has a list of rugby union footballers who were killed in both world wars – some 27 men gave their lives. One such man was Francis Nathaniel Tarr who served a Lieutenant in the 1st 4th Leicestershire Regiment. 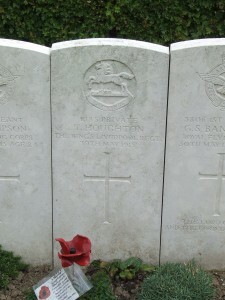 He died on the 18th of July 1915 aged 27. Francis or Frank as he was known rests in the Railway Dugouts Burial Ground (Transport Farm), some 2kms west of Killebeke, Belgium. Another rugby man was James Henry Digby Watson, known as ‘Bungy Watson’. Born in 1890 he qualified as a doctor and was killed while serving as a surgeon aboard HMS Hawke when it was torpedoed and sunk in October of 1915. 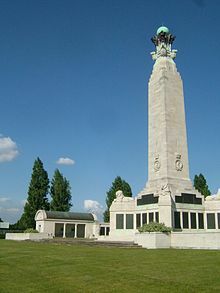 ‘Bungy’, like many other who served at sea is commemorated on the Chatham Naval Memorial. This entry was posted in News on October 25, 2015 by carol. A war memorial, taken from its hanging place, placed in a cupboard for safe keeping, then forgotten for decades. The framed memorial was found on the fourth floor of the Caledonian Hotel, hidden away with other memorabilia and now found by members of the modern day staff. 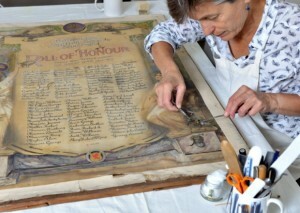 Helen Creasy, a paper conservator has been given the mammoth task of repairing the memorial that is believed to contain the names of the hotel staff who went to fight in the Great War of 1914-1918. The restoration has been made possible by a grant from the Scottish Government backed War Memorials Trust. Other memorials throughout Scotland have also been recipients of grants. The third in the series of headstones, photographed while walking the cemetery photographing headstones for a forthcoming project. This headstone does not form part of the project but, like a few others, it seemed to stand out! The very simple and clean looking headstone, with the odd piece of damage just above ground level, is to George Perkin and his wife, Bridget. Why did this headstone stand out from the rest? Most headstones give details of a names, dates of death and if you are lucky, dates of birth. Some, will give a clue as to armed service, while others tell of an occupation, a town of residence or area of birth – information that the deceased or their family were proud of and wished the visitors to the cemetery to see and take note of. 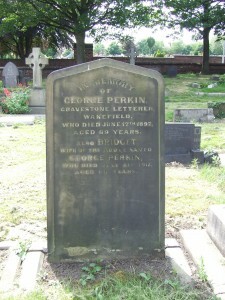 George Perkin’s family were one such family as his headstone proudly displayed his occupation, that of ‘gravestone letterer’. George died on June 17th 1897 aged 69. But who was he in life? Rishworth Street, Wakefield. Source unknown. George was born around 1828/9 in Wakefield. Working backwards, as we only have two names to work with. A look in the nearest census to George’s death, the 1891, we see George aged 63 and his wife Bridget aged 59, living at 2 Rishworth Street, Wakefield. George gave his occupation as ‘retired monumental mason’. Ten years earlier, 1881, the couple are still living on Rishworth Street, his occupation now being described as ‘gravestone letterer’. On April 14th 1873 George married his Bridget nee Fearnside. The entry in the church of St John’s, Wakefield tells that both were of full age – George was around 45 years of age. He was living in Rishworth Street and his father’s name was given as William Perkin, a mason. Bridget’s father was David Fearnside, a blanket manufacturer, living on Northgate – just around the corner from Rishworth Street. The witnesses to the union were Frederick Kitson Perkin (Kitson was his grandmother’s maiden name), and Ann Ashton. There are two entries in the parish registers for that day, both preceded over by Edward Bell – the first wedding of the day was for George and Bridget and the second was for Harry Mountain and Ann Longbottom. Reverend Edward Bell, seems to have changed his writing for the second ceremony, seeming a little rushed, having larger writing and not as neat. 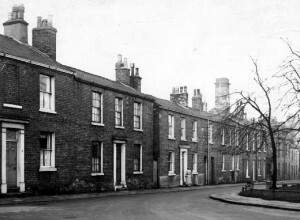 Two years earlier in 1871, George is at Rishworth Street, the head of the house and living with his unmarried sister, Mary Ann and Sarah A Fletcher, his niece. George tells the enumerator that he earns his living by being a ‘gravestone cutter’. The 1861 census sees George and his siblings living with Margaret, their widowed mother, still in the same house, on Rishworth Street. Margaret, aged 58, gives her occupation as ‘provided for by her children’. George tells he is a ‘stone mason, gravestone cutter and **** at St John’s Church’. Other sons are working as ‘clock and watch maker’ and two sons are a ‘mechanic at the local iron foundry’. Ten years earlier in 1851, there is still no sign of George’s father. Margaret is now aged 47 years old and on ‘parish relief’. George, aged 24 is a stone mason, as is his brother Henry. While, Charles aged 21 is a ‘tobacconist’s assistant’ and Edward aged 14 is an ‘errand boyh’. The remaining five children range between 4 and 11. The age of the youngest child could hold the key to when their father died! After working back for many decades the 1841 census gives the information – George and his siblings father. Living on South Street, William Perkin, ‘stone mason’, aged 35 (remember the ages are more than likely rounded up in this census). 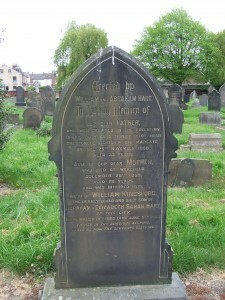 The Freebmd collection of death’s has two entries for a William Perkin in the Wakefield area. The first is the March 1/4 of 1849 and the second is also in the March 1/4, but the following year, 1850 – which one is Margaret’s husband? That information is not needed at this time as George and Bridget are the focus of Sugar Lane iii. George died on June 17th 1897 aged 69 years. 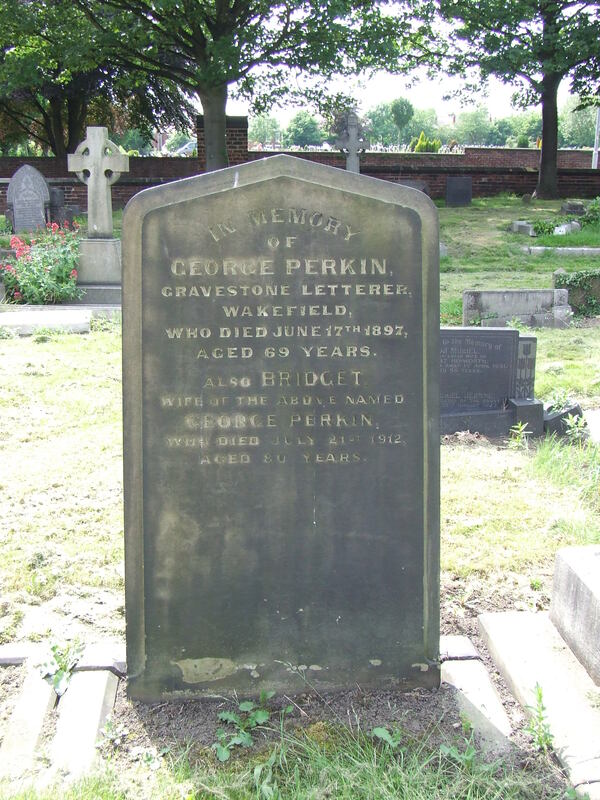 In memory of George Perkin, Gravestone Letterer, Wakefield, who died June 17th 1897, aged 69 years. Also Bridget wife of the above named George Perkin, who died July 21st 1912 aged 80 years. An entry in the Probate Registers, tells that George Perkin, gentleman, had Probate granted on the 13th of August to Bridget Perkin, Frederick Kitson Perkin, silversmith and jeweller and Henry Turner gas-fitter. Effects £2709 10s 2d. Bridget lived on to see two more decades, dying on the 21st of July 1912 aged 80. Probate for Bridget was granted in the August, to Herbert Caress, schoolmaster and Walter Lumb, butcher. Effects £1625 5s 5d. Bridget died in the year that the Titanic sank. The year that Lawrence Oates, leaves the tent of Scott’s South Pole expedition, never to be seen again. The year that the first non-stop flight from Paris to London was made in just 3 hours, and Harriet Quimby became the first woman to fly across the English Channel. The Piltdown Man, the famous hoax, claimed to have been found in this year. This was the year that Suffragettes smashed shop windows in London’s West End. The movement were in the headlines and would be the following year when Emily Wilding Davison by giving her life for her beliefs. This entry was posted in General on October 24, 2015 by carol. Sugar Lane cemetery ii – Hart family. Another headstone is highlighted from Sugar Lane cemetery, Wakefield. We know who erected the headstone, but why did they not put their parents’ names for all to see? They were proud of their father but more than likely saddened at the way he lost his life – but who was their father? Where to start? An internet live chat with a librarian from Deal came up with nothing on the drowning, so no clue to his name there. A quick look at Freebmd for deaths in the deal area around the date revealed nothing that you could say ‘that’s him’ to. So I decided to go forwards and eventually go back……………..Bingo! I looked for Abraham on the 1871 census first, since the name is less popular than William but found no Abraham. However, the 1861 census showed Abraham aged nine born in Deal (I now had his approximate birth year) living with his mother, Sarah. This was confirmed by the fact that she gave her occupation as ‘pilot’s widow’. She was aged 39 and born in Ash (?) Kent. The family was living at Water Shale in Deal as were quite a few other pilots and their families. But why was William not with his mother and sibling? Further researching on the 1861 census showed William to be a pupil at Greenwich Hospital School. The Royal Hospital at Greenwich was Britain’s largest school of navigation and seamanship. During the time William attended the school, it was housed in what is now the National Maritime Museum. I needed to find his birth and in the 1851 census I found William aged one, living with his mother at 20 Water Street, Deal. The head of the household was Abraham Hart aged 27, who gave his occupation as that of mariner and his place of birth Deal – the anonymous parents of William and Abraham had now come to life. By 1871 Abraham was living with his mother in St Mary’s Square, Lambeth, where Abraham was a Surveyors Pupil and as for William there were quite a few saying they were born in Kent but nothing to point a finger at and say ‘found you!’. The family so far were in the South of England. When and why did they come to Wakefield? The 1881 census answers that question as by then Abraham, living in Northgate, was an architect and surveyor, married to Elizabeth. They had three girls and grandma was living with them. William in 1881 was married but on the night of the census he was with 11 other pilots on the Granville out of London. Sarah was not on the 1891 census as I knew she had died in 1899, Abraham, however, was living at 99 Northgate and by 1901 he was residing at Oxford House, Oxford Road, Wakefield. His brother, William, following in their father’s footsteps, was a Trinity House Pilot in the Cinque Ports living with his wife, Caroline and two children in Malcolme Regis. Ten years later Abraham was living at 24 Leeds Road and had been married to Elizabeth for 36 years. The couple had six children but sadly lost one. William was living in Dover with a group of other Trinity House Pilots, while Caroline, who said they had been married 23 years and had had three children, lived in a nine-roomed house named Sh**ad House, Deal. William Kingsford’, the dearly loved and only son of Abraham and Elizabeth Sarah Hart of this city. Born March 12th 1885, died June 5th 1908. ‘Father in thy Gracious Keeping, Leave we now thy Servants Sleeping. Abraham now of 2 Buxton Place, Newton Bar, died on December 29th 1938 and Probate was granted to Barclays Bank on March 1st of the same year, leaving £1270 11s 4d. This entry was posted in General on October 22, 2015 by carol. It is amazing how many interesting headstones you can find in your local cemetery or churchyard. An ever growing population soon brought the churchyard burial grounds to bursting point, making a need for a Municipal cemetery. 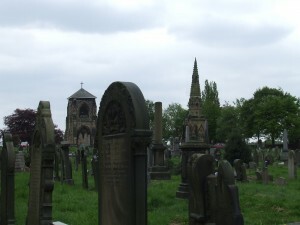 Sugar Lane cemetery, Wakefield opened in 1859 covers over 9 acres on land once owned by Sir J Pilkington. The cemetery is divided into Conformist, Non-Conformist and Catholic sections. The division of religion at the time was shown by the central twin chapels, as many used to say ‘one for us and one for them’. The funny thing is that both the Church of England and the various Methodist religions used to say the same thing, making the saying work for them. Over the past 12 months I have been researching over 250 men and women who either rest in or are remembered on headstones in, as it is known locally, Sugar Lane. Whilst walking every row and reading every headstone I found who would form the basis of the research but also found many other interesting headstones that sadly fall outside the criteria I had set. 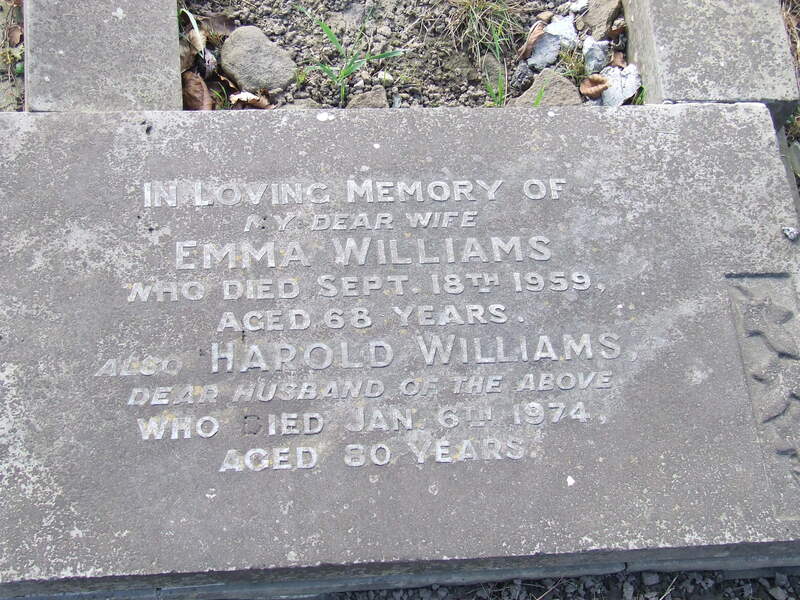 In loving memory of my dear wife, Emma Williams, who died Sept 18th 1959 aged 68 years. 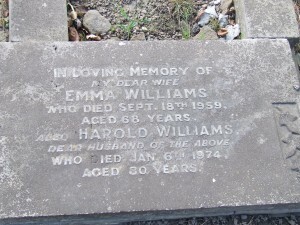 Also Harold Williams, dear husband of the above who died Jan 6th 1974 aged 80 years. 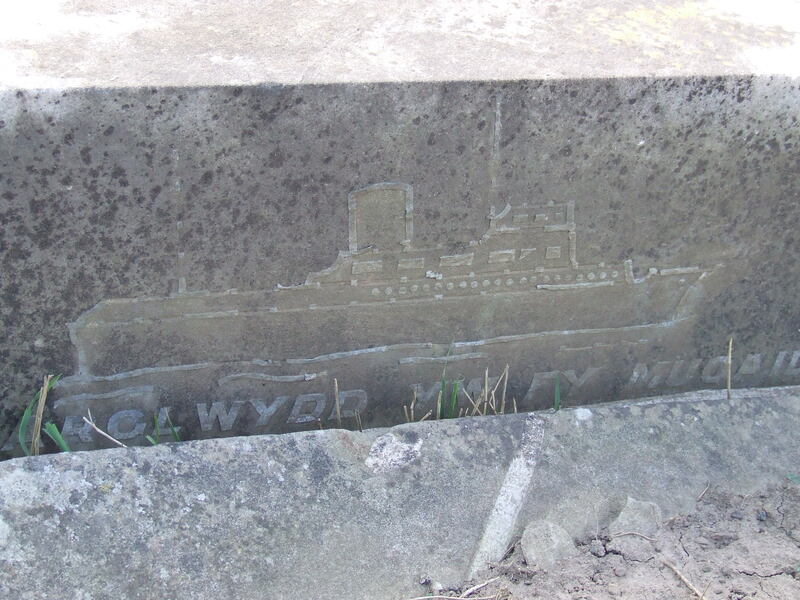 Nothing remarkable, you might say but the headstone has engraved on it a vessel and the words ‘Arglwydd yw fy Mugail’ (The Lord is my Shepherd). Possible clues: Was Mr Williams Welsh or were his family Welsh? 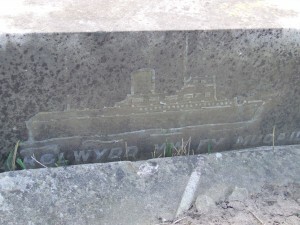 The name Williams and the Welsh inscription below the ship would appear to indicate that. 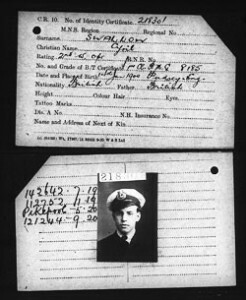 The Ship: Did Harold serve at sea in WW1, as he was old enough? Was he in the Royal Navy or in the Merchant Services? Intriguing, but perhaps the mystery is buried for ever or does someone out there reading this now the answers to these questions. 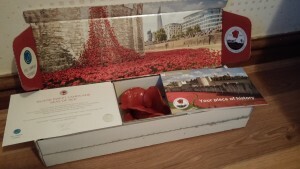 Well, thankfully, my Tower Poppy is still in its original box – no thanks to the delivery driver who left it by my back door on a drizzly day and with no receipt signature. I still cringe at how the box would have ended up if it had been raining hard………………mush probably. Luckily, my poppy arrived with little water damage to the exterior box. The poppy, was still wet from its wash and there was still some Tower of London moat soil attached and the stem had gone a little rusty, but who cares! My family, like many other families from around the world, had husbands, brothers, sons and a few wives and daughters who served during The Great War, a war to end all wars and like many other families around the world, we had our losses. 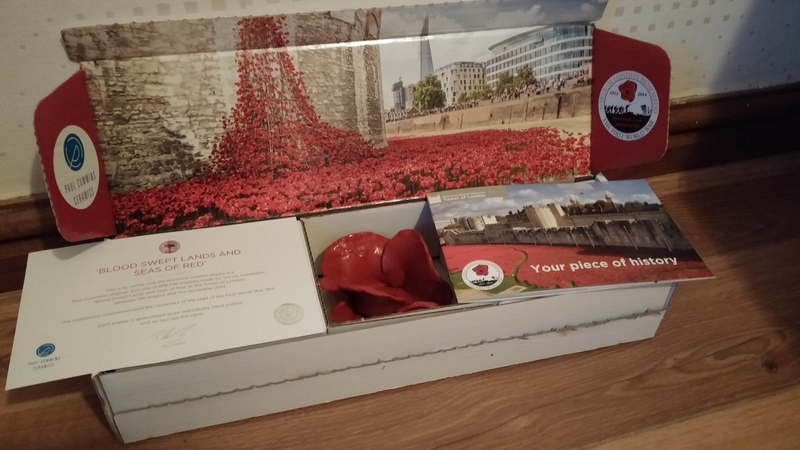 Now, one year on since the eyes of the world focussed on, and crowds headed to the Tower of London with its cascade of blood red poppies, I was in France………..
You may be wondering what is the connection? Read on and you will soon see. During the summer I was on one of my regular visits to France and Belgium. The weather was hot, so time was divided between reading outside and researching for information on over 250 WW1 soldiers – well what else do you do whilst on holiday. There was the odd trip to the local supermarket and time spent chatting to friends. 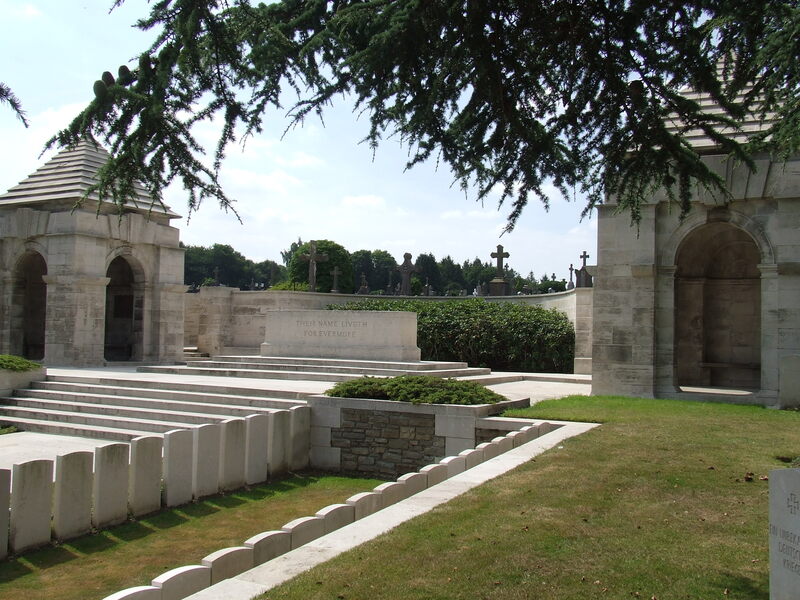 One cooler day I decided to pay a visit to a local CWGC cemetery – a journey that should have only taken less than 15 minutes. I had looked at my trusty, or not so trusty, CWGC cemetery booklet, plotted my route and off I went heading for the village and the road marked on the map as being the closest to the cemetery. 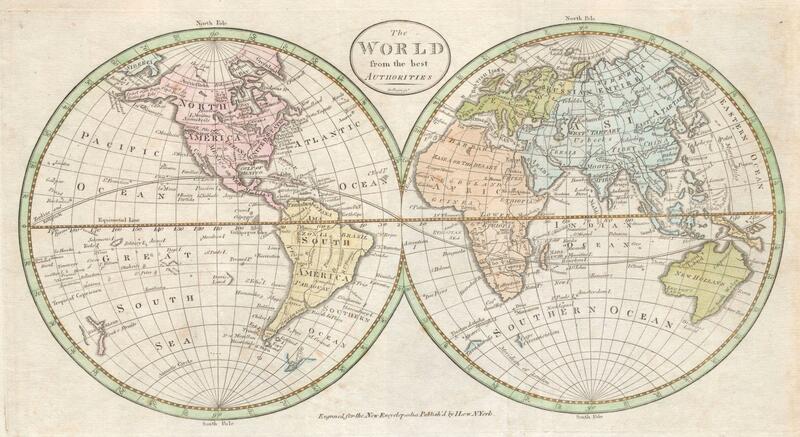 I can now tell you that location dots on maps are not always printed in the correct place. I drove around the village, asked villagers – yes, my broken French worked but nobody knew of the cemetery I wanted. Back to compare the road map and the CWGC map and try a few of the other local villages. After nearly an hour of driving around some pretty villages I decided to go home and set ‘Sally Satnav’ for home. I had criss-crossed many roads during the afternoon, and saw places I had seen earlier. Does this sound familiar? ‘Sally’ bless her was taking me home via the quickest route and soon I knew where I was, heading to a large round-a-bout near to where a very large supermarket used to stand. I had been close to this round-a-bout earlier, coming off a road and turning right……..If only I had turned left! 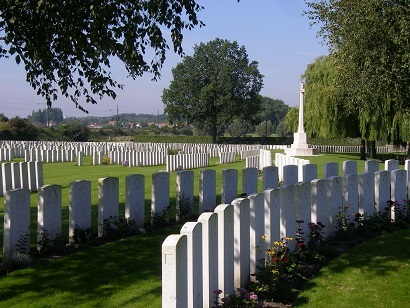 There was the focus of today’s outing- Longenesse Commonwealth War Graves Commission cemetery. Longenesse Souvenir CWGC cemetery is situated alongside the busy D928, Rue des Bruyeres, close by the D942, dual carriageway, that I had exited earlier and turned right, not left! The cemetery forms part of the large community cemetery. I parked in the communal cemetery parking area and walked through the French cemetery until I reached the white walls and the twin lodges that seemed to guard the headstones from many nations. The cemetery contains 3177 identified casualties, mainly from WW1 and during that afternoon I paid every one of them a visit. I was the only one walking around most of the time, another couple parked on the main road, stayed a short while then went, leaving me and a rather large hare who seemed to be enjoying the open space. Near the entrance are the graves of some members of the Chinese Labour Corps., German soldiers and a row of English nurses and V.A.D. volunteers. Walking down each row there are a few who I will write about in detail later as they had an unusual surname or they were the recipient of an award – something to make them stand out but not any more special than the rest. 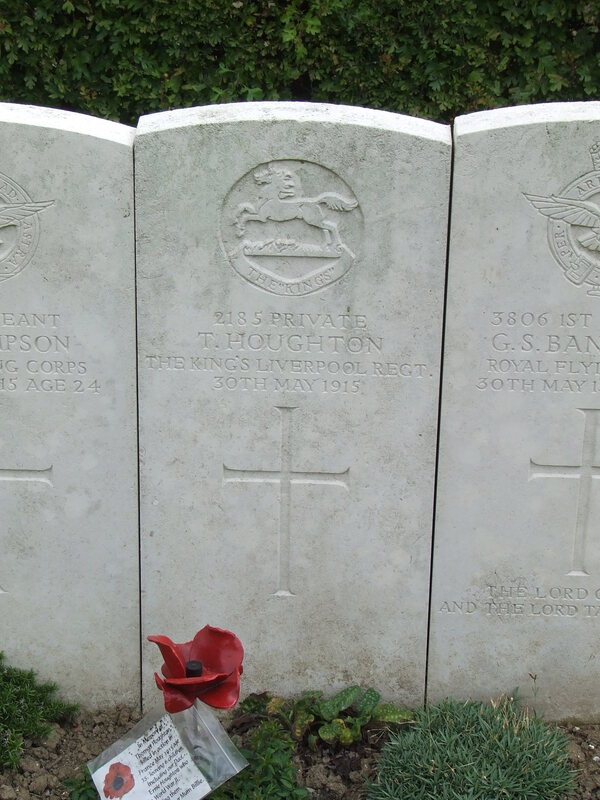 One such grave that stood out from the others was the grave of Private 2185, Houghton, T, of The King’s Liverpool Regiment, who died on the 30th of May 1915. Why did his stand out from the others that had photographs and poppy wreaths left in remembrance. 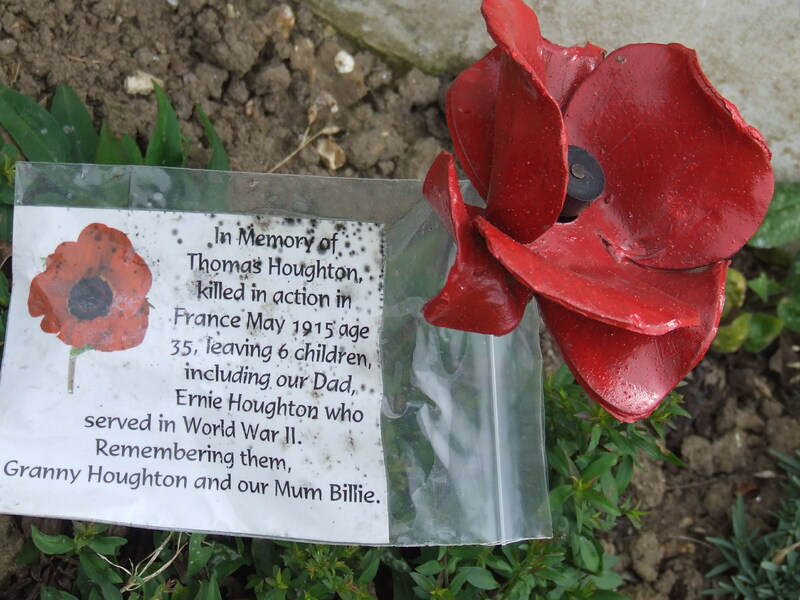 Private Houghton’s grave rested shoulder to shoulder with its neighbour but at his grave side a Tower of London Poppy had been left by his family with a short message. Private T Houghton – who are you? From the message left by his family, I knew that he was called Thomas and was 35 years old when he died. He was a married man and left 6 children to be looked after by his wife. Thomas, was born in Formby, Lancashire, lived in Bootle, Liverpool, and enlisted in the town of his birth according to the SWDTGW, but who was he before the war took his life. The 1911 census has a Thomas with Elizabeth as his wife. They had been married 7 years and had 5 children, one of them was Ernest – a clue given on the little note. The website Freebmd has 2 entries for 1903/4 but one stands out. The 1911 census has Mary Hefferman aged 22, sister-in-law, working as a monthly nurse, living with the family. So, it looks like Elizabeth is Elizabeth Hefferman, born in Dublin who married Thomas in the December quarter of 1903 in the Ormskirk area. Thomas worked as a house painter and little did he know that he was to have one more child before joining the army. The service record for Thomas, on a quick search, is not found, but his Medal Card and the Soldiers’ Effects Register give details on his medal entitlement and how much Elizabeth, his widow and sole legatee was eligible for. It seems she received £1 11s 11d in October 1915 and £3 War Gratuity on the 17th of October 1919 – not a lot when you have lost the breadwinner in the family and you have 6 children to provide for. Thomas died on the 30th of May 1915 ‘in action’, and rests should to shoulder with his comrades in a foreign land that will forever be England. This entry was posted in General on October 18, 2015 by carol. Place names – not all plain sailing! Place names – not all plain sailing! Were they really born there? A census entry is only as good as the person who gave the information. Did they really want officialdom to know all their secrets. Nowadays with the many transcripts, a census is only as good as the original information and now who transcribed those historical details for online companies. For example, say a John Riach is found on a family tree sent by a distant relative. John is a relative you have been missing but have now found thanks to your newly supplied information but all you have been given about John is his birth year as he is from a distant branch of your family. Where do you then go looking? If you are in the the highlands of Scotland you would go to Dallas, Morayshire but if you are in America, would you probably look in Dallas, Texas records – you could be looking in the wrong country. Scottish place names – Dallas, Aberdeen, Dunoon, Balmoral, Blairgowrie, Oban, Elgin, Glasgow, Inverness. English place names – Hollywood, Liverpool, Windsor, Richmond, Newcastle, Exeter, Glossop, Spalding, Hastings, Worthing, Brighton, Crofton, Manchester, Brighton, Carlisle, Durham, Sheffield, Wakefield, Hull and the list goes on. Welsh place names – Bangor, Cardiff, Welshpool, Caernarvon, Swansea, Haverford, Abergavenny, Ebbw Vale. Irish place names – Erin, Munster, Ulster, Antrim, Armagh, Fermoy, Dublin, Limerick, Waterford, Roscommon, Derry. The moral of this tale is don’t always trust place names included in a family tree on an online website. Don’t always trust other people’s research. Check where you can, and make a note that the research is not yours, if using information from another source. On the up side, by looking in other countries, such as America, the Caribbean, Australia, New Zealand or South Africa, you may come up with the information you have been searching for. This entry was posted in General, News on October 18, 2015 by carol. From the early 1800’s the lives of our relatives started to change and many thought their privacy was at risk – little did they know what was to come! The BBC have put together a timeline and many of the events could help you answer one of your family history conundrums. 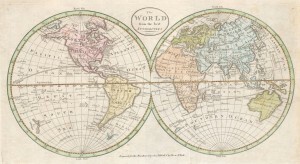 As time moved on, more information was beginning to be collected, Acts of Parliament and Laws were being made, social life was changing and the population was moving around the country and the world – sometimes not always by choice. For example the census of 1801, was basically a headcount. It was not until 1841 that every person was named (with a few exceptions where initials are used i.e. Asylums), their age within a range, and if they were born within the county or not. The 1851 census, now gave you a correct age, well, if they gave it correctly, a place of birth not just a county – this census was the first one to be of any real use. The Central Criminal Court had been established in 1834, as had the Poor Law. One or both of these could have had an impact on your family – I know one of them certainly did on mine. Other Laws and Acts that many of our relatives could have been involved are, the Matrimonial Cause Act of 1857, the Abolition of Transportation in 1868 and in the last century the National Adoption Register of 1927. Why not visit the BBC‘s family history section, click on the photograph links for an overview of the information plus links to other sources. Also, click on the ‘page’ icon to give you access to other dates such as :- The Swing Riots in 1830, the Registration of Merchant Seaman in 1835, the Naturalisation Act of 1844 and the Abolition of Slavery also in that year, the Cotton Famine 1862 – 1866 and the Establishment of the Trade Union Congress in 1868. I recommend that you pay this site a visit and bookmark the information for future reference. This entry was posted in General, News on October 2, 2015 by carol.